Clicking Settings Icon on the top of the Hall of Hands Studio, you will be able to configure the Studio as desired. 1. Log me in automatically - connect your Studio to your Facebook account automatically when running. 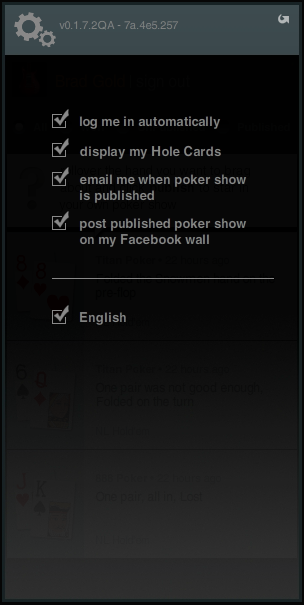 2.Display my hole cards - this is a Studio notification which displays your just dealt hole cards, on the bottom of the screen (applicable on selected poker rooms only). 3. Email me when poker show is published - email to notify you when your poker TV show is ready. It includes a direct link to your poker TV show that you can forward to your friends.